Relatively new to the forum and was just wondering if there's any smart and brown lathe owners on here. I have a smart and Brown model L capstan lathe. All original except for the motor. 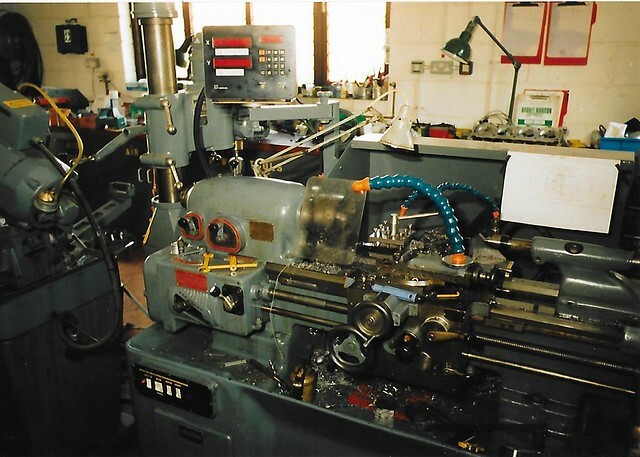 At Epping Forest Horology Club we have 5 model 'L' lathes in daily use with a cabinet of collets, chucks, step chucks, etc etc, and also a model 'A' later type, screwcutting lathe. Don't suppose you have a spare 48 toothed gear for the model A do you? I have a Smart and Brown Model A Toolroom lathe that I have had for over 18 years, it was originally suplied to the Atomic Energy Authority so it probably glows in the dark. It's rock solid, built like a tank with large vee and flat guideways with a bed the width of a cricket pitch, well almost. ........Here's mine in a similar shade of green to yours Martin. this is mine as i got it. It's running a 160v DC motor with speed controller. I have had a Model A Mk2 for more than 40 years now. It had been in a REME workshop where they only worked on huge commercial vehicles. So my lathe had seen very little use when I bought it at a government auction. It has done plenty of work for me since.